I am delighted to announce that my new play, “The Empty Charcoal Box” will open the new season at Oran Mor on Monday August 28th. “The Empty Charcoal Box” is the tragi-comic story of how a long-hidden event of extreme violence 45 years ago has haunted the lives of three Ayrshire Schoolboys ever since. A contemporary crisis mean that Billy, Eddie and Deansy are finally forced to confront that age old question which determines our path to wisdom: Should we look backwards to try undo our mistakes, or forwards and try not to repeat them? The play will be directed by myself and will feature three of Scotland’s most talented actors, Ryan Fletcher, James McKenzie and Gavin Jon Wright. The play will use sound, movement and live music to tell this darkly comic tale of guilt, retribution and rebirth. Amongst others it features the work of Curved Air, Pink Floyd, John Kongos, Sham 69 and The Ramones. Ryan Fletcher has most recently been seen on the stage as Phil McCann in “Cuttin’ A Rug” at the Citizens and in “Milk” at The Traverse, and has appeared in “River City” , “Gary Tank Commander” and “The Limmy Show” on the small screen. Gavin Jon Wright is just back from the US tour of “Titus” where he played the title role. He played “Spud” in Trainspotting at The Citizens, and features in the role of Hugh Kirk in the recent three part ITV Drama “In Plain Sight”. James McKenzie was last seen onstage at the Oran Mor and The Traverse as John Wilkes Booth in “His Final Bow” . He also appeared in the NTS production “Rites” and will be familiar to “River City” fans for his role as Gary Trenton. The play runs from August 28th till September 2nd. I am copying this email from Bob Davidson, Chief Executive of Renfrewshire Chamber Of Commerce. If you open It, they will come – Hack Day at UWS TV studios. In Field of Dreams Kevin Costener’s character is told by an invisible voice ” If you build it , he will come” . So this guy, who everyone else thinks is crazy, builds a baseball stadium in the middle of his corn field, and sure enough, Shoeless Joe Jackson and the Chicago White Sox team of 1919 emerge out of the corn to play a game of baseball. That same blind trust in providing the facilities for an as yet unplanned gig is shown by the ghost of Jim Morrison in Wayne’s World 2 where he advises Wayne that Aerosmith will show up for Waynstock , if only he has the courage to book them. Well, that’s all fine and dandy for Hollywood dreamland, but what’s it like in real life when you announce an open creative space at a certain time and place hope that someone decides to show up and fill it? That’s where we were five weeks ago at the University Of The West Of Scotland‘s £80 million pound campus in Ayr when we announced that every Wednesday there would be a “hack day ” in our new TV Studio where students could come along and just “create stuff”. For what it’s worth, the new studio is light years ahead of our old facilities on the Cragie Campus and we are searching for new ways of using these fantastic facilities. The new campus requires a new imaginitive mindset, so hence the “hack day” initiaitive. The point is, would it work? The first week, six students turned up, all of them actors on our Contemporary Screen Acting Programme. So far so good, but there is a limit to what actors can achieve without technical back up. The breakthrough was when my colleague Jane Robertson realised that we could integrate the process where some students were creating their marked assessments, while others on the production side were voluntarily helping them to record them. Except we didn’t have any on the production side. So we expanded the invitation, and got the support of our colleagues in other programmes, notably Paul Tucker in Broadcast Production, to advertise as widely as possible. The second week , 7 actors turned up, and one brave Broadcast Production student. The third week, we had MORE actors, and TWO production students. 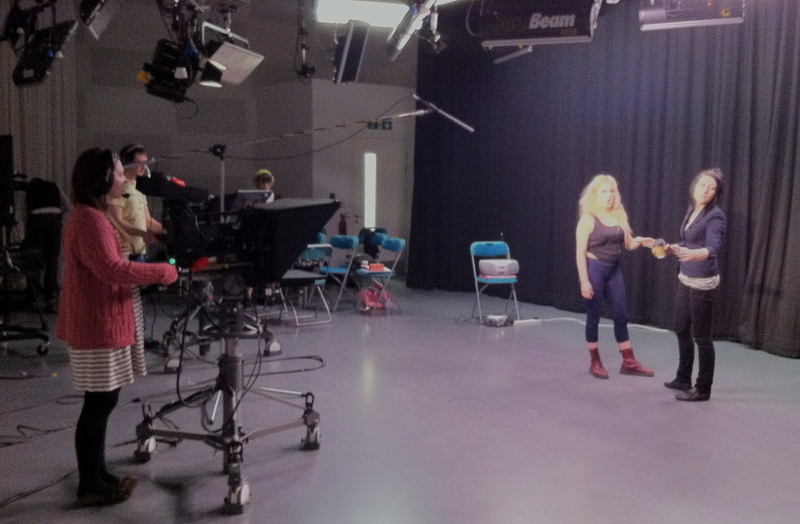 Now in the fourth week, we have 4 broadcast students, two film makers, and 15 actors, all of whom (without tutor input) are rehearsing, lighting, recording and editing work for their own individual portfolios. Anna Kennedy, Mike Murray, Emjay Doherty and Lizzie Kane in the TV Studios. I couldn’t be there for the first hour of the process yesterday , and apologised to students in advance. Of course, if I wasn’t there, nothing of any import could possibly happen. I arrived AN HOUR AND A HALF late to find groups of students from three different programmes rehearsing, recording, and generally enjoying the creative atmosphere…ON A VOLUNTARY BASIS! More than this, the students had started arranging to help each other with technical support and encouragement even outwith the “hack day ” time slot. I heard one group agreeing to collaborate on the basis of “working from 4pm till 8pm at night.” Have you ever tried to get students to stay even half an hour after class at 4 pm? Here they were agreeing to work overtime amongst themselves. It’s too soon to tell if the euphoria of the first few weeks will continue. No doubt as we get closer to assessment deadlines the numbers may drop off, but for the moment, the experiment has proved a success. I am hoping that in the future on this blog I will be able to showcase some of the students creative work to show just what the possibilities are for this way of working. In the mean time, hopefully, we’ll build it, and they will continue to come. 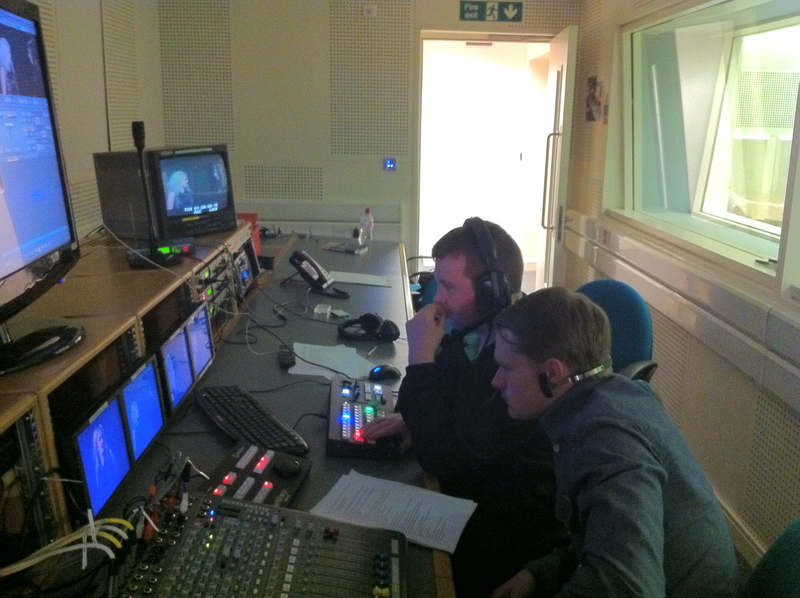 Steven Black and Gareth Malone in the Control Room.